Scotch Eggs, sadly, contain no scotch. 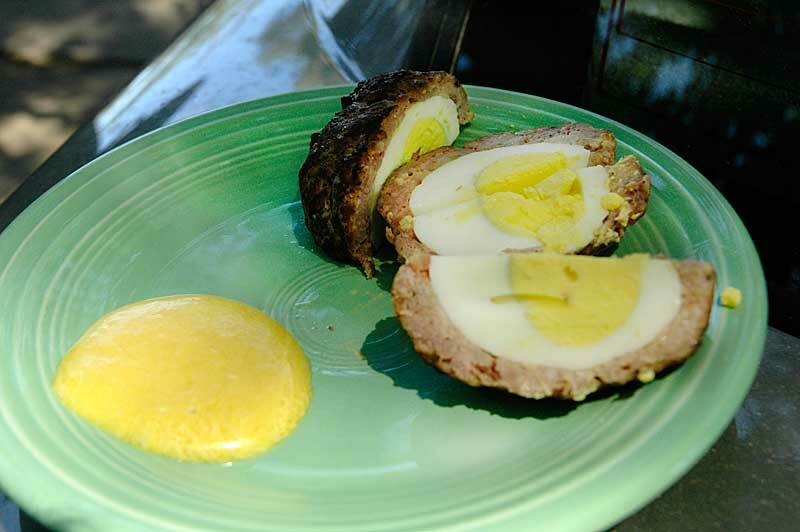 They are en English dish that is usually a peeled hardboiled egg, wrapped in sausage, breadcrumbs, then fried. Today you'll often find them served hot as pub food, but traditionally they've been eaten cold too. 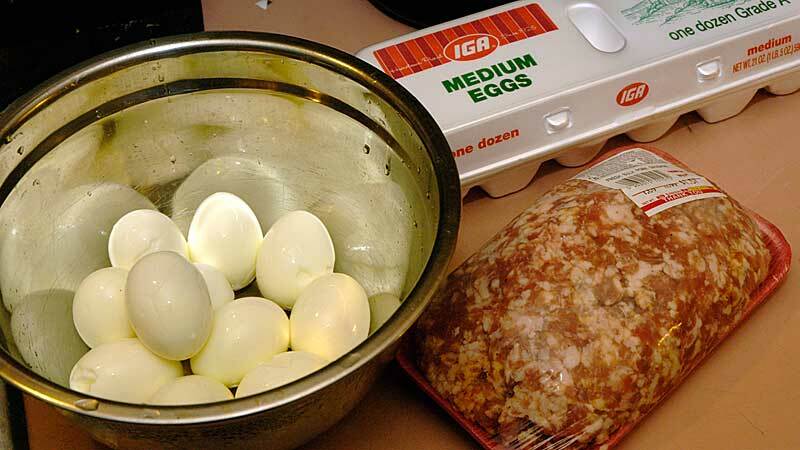 We'll get started with a bowl full of cooled, peeled, hardboiled eggs and our sausage. Remember that older eggs peel better and if you cool them quickly you'll avoid the green ring around the yolk. In my experience you can get 6 eggs per pound of sausage if you use medium, 5 with large, and 4 with extra large eggs. I usually made a few more than I need anyway. From here, they're easy to assemble. 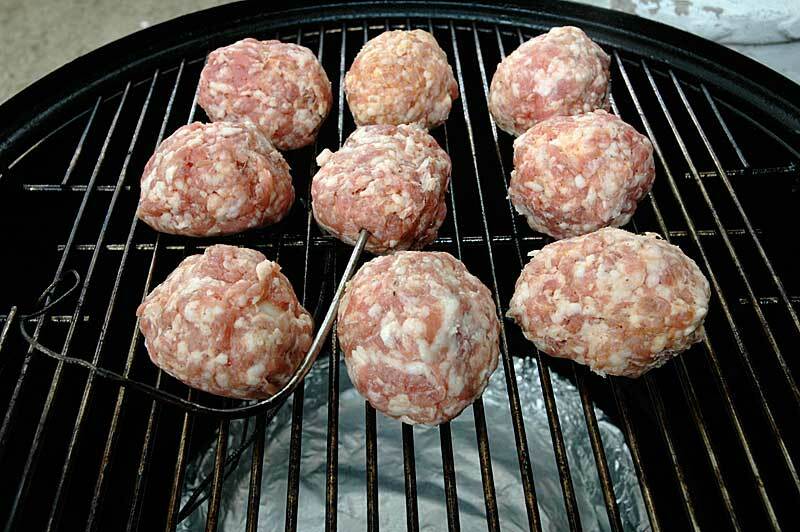 Flatten a big pinch of sausage, put an egg in, and roll the sausage closed around it. Pinch the seeams to help seal it up, but don't work it for too long. Ground meat gets soft as your hands warm it. 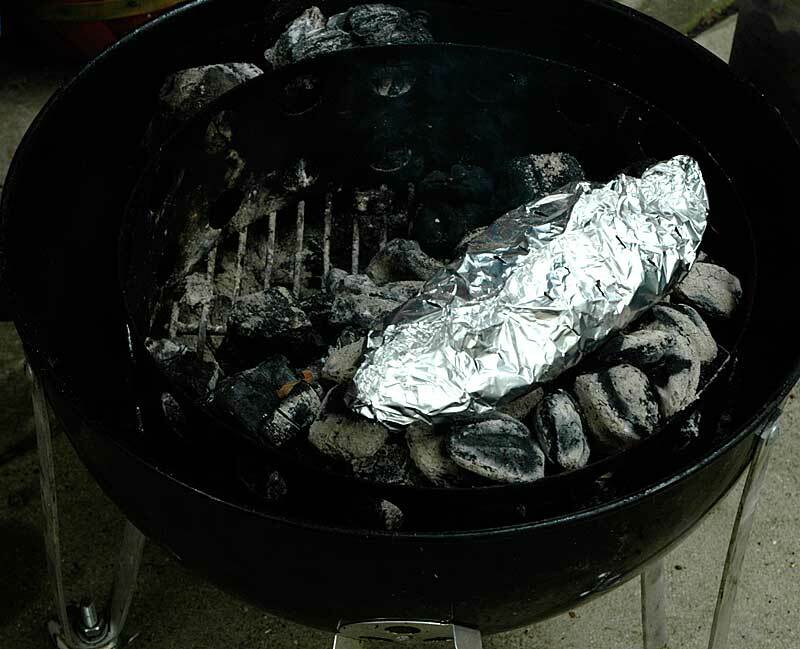 You can optionally coat them with your favorite rub or even wrap them in bacon. I left mine plain and put them on the smoker. I'm using my Weber chimney to start about 20 pieces of kingsford. Experiment to find what works best for your smoker. 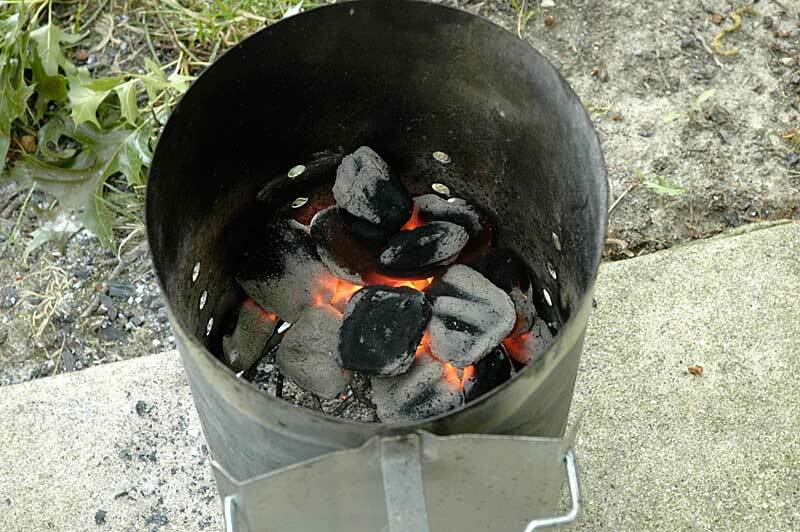 Once the coals were lit, I placed them on top of a bed of unlit coals. On top of that I placed a foil pouch with 2 large handfulls of apple chips in it. Poke a few holes in the top of the pouch for a slow long burn of your wood chips. Today I'm running my smoker at 225 degrees. In two and a half hours my eggs reached 175 degrees. 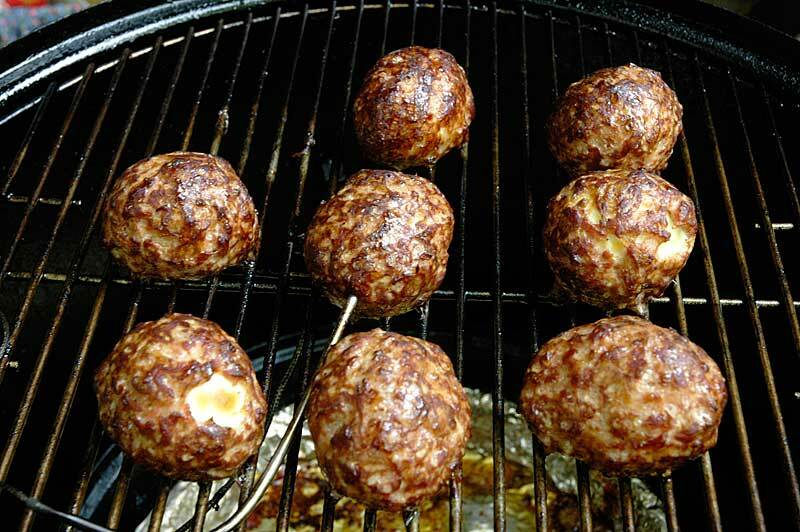 Ground meat products need only be cooked to 165 but I've found going a little longer with sausage can let extra fat render out and still not result with a dry end product. When working with a relatively large amount of hot food, you must be careful to cool it properly. If cooled too slowly, you run the increased risk of food born illness. Even worse, a load of hot food placed into the refridgerator might bring the entire refridgerator up to an unsafe temperature for hours after. 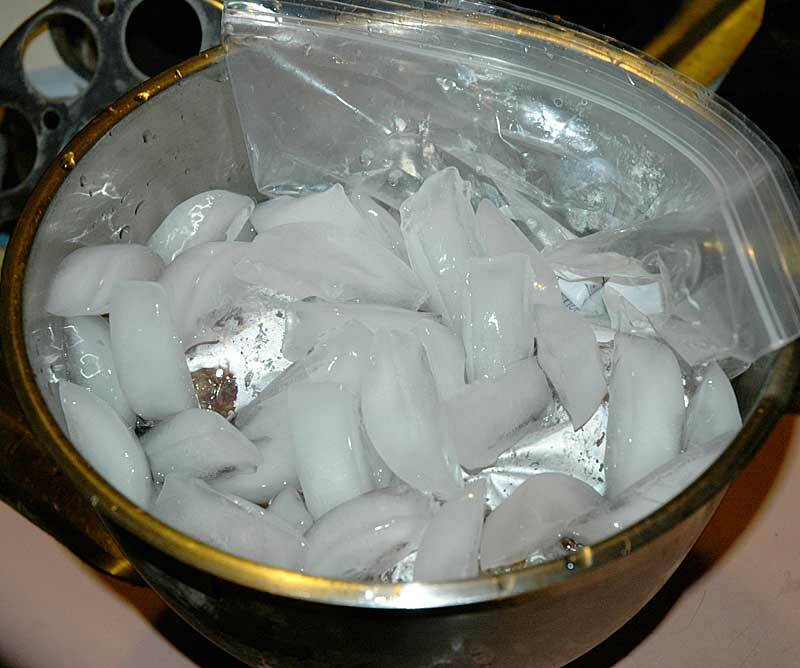 I've loaded my left over eggs into a ziplock back and submerged them in an ice water bath to cool for several minutes. I enjoy my eggs warm with a little mustard sauce. Something in the neighborhood of a tablespoon of mayo, a teaspoon of yellow mustard and a half teaspoon of sugar makes a great sauce for a one egg snack.